We all see things through our own lens of perception, and current events are tinted not only by those that present the news, but those that perceive the news. So without further ado, I present current events in the mind’s eye of Republicans (R), Progressives (P) and conspiracy theorists (CT). Note: I am a progressive that agrees more with the conspiracy theorists on issues than I agree with Republicans. And I am a conspiracy theorist skeptic. R: Obama is really not a U.S. citizen, he’s an Irish National, and this trip proves it. Also, Obama’s great, great, great grandfather was a member of the IRA and Obama is promising more funds for the terrorist group because Obama, if not Muslim, is a Catholic terrorist. P: If I was the President and could use my ancestors to visit the Irish countryside, I would too. CT: His great, great, great grandfather was a member of the powerful Irish Illuminati Mason member of the Bilderberg group and Obama got elected President through the command of his dead ancestor’s dying decree. Issue: Oil Prices are going up! R: Why isn’t Obama doing anything about oil prices? P: Oil prices are rising because of increased demand and the wars in the Middle East have reduced the world’s supply of oil. CI: The Bilderberg Group controls oil prices. They are raising the prices to control third world nations and keep them down. Issue: A recent drop in gas prices (as of 5/8/11). R: It is the Bush energy policy of offshore drilling and deregulation that has brought a drop in oil prices. P: People are consuming less oil, so the price has momentarily dropped. CI: The Bilderberg Group controls oil prices. They are keeping prices down to protect their industries’ profits. R: Thank God George Bush started that war in Afghanistan; otherwise, we would have never killed Bin Laden. P: Can we leave Afghanistan now? CT: The Illuminati put him in his position of power, and they took him out. Beside, he died earlier and the NWO thought that this was the best time to bring out his showcase death. R: We must cut government spending and government jobs to increase employment. P: More jobs programs and infrastructure development funded by military cuts, the end to the two costly wars and a tax rate that makes wealthy individuals and corporations pay their share is the best way to address unemployment. While I generally agree that the elite want to control employment and keep down the masses, they lose me when they say, “As a matter of fact, the Illuminati created Sweden as an experiment in mind control, together with Canada, which is Sweden’s sister country in this project.” (ibid) Furthermore, the many NWO conspiracy groups are very anti-socialist, but they speak of employment as Marx might have. P: It may be too late, but it is our duty to try to reduce our impact on the planet. CT: Some in the NWO group say that global warming theory is being used as birth control against the planet’s people. Some say it is a psyop used to brainwash us. Some say global warming theory is being used to enslave us. I think global warming is a theory being used to track, trace and expose all conspiracy theorists through their writings on global warming and visits to chat groups that discuss global warming. R: Bomb, bomb, bomb, bomb, bomb Liby…what? 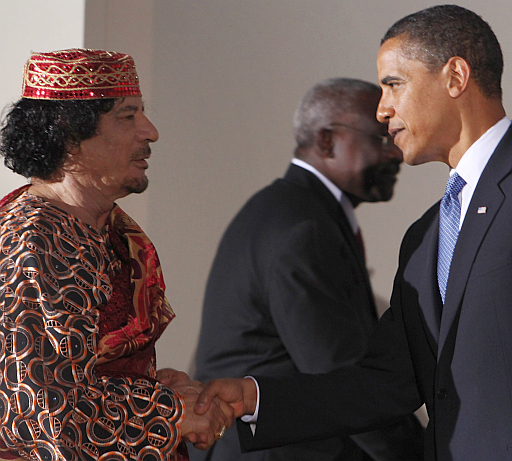 That was Obama ordering the bombing of Libya? Then I am against it! P: Bombing isn’t the answer and won’t end the conflict. CT: Gaddafi is a Free Mason and that is why he hasn’t been killed yet. So whether you blame Obama or the NWO for our problems, I invite you to support progressive, humanist solutions. On Global Warming, I’m all for it, I’m 30 minutes out of Chicago and Chicago Winters get pretty cold. Just think of the money I’ll save from not having to move to Arizona or Florida. I wish I could send up some of our (Arizona) summer heat to you for the winter. I think Arizona would be barren of Chicago was warm in January. Now seriously Tex – if elite conspirators were ever involved in something other than decreasing the rights of Americans – it’s the increase in the price of gasoline. Increasing the price of gasoline keeps idiot Americans down with the war on ter.. .I mean Islam. Good point. I don’t think it’s the Illuminati though, I see the Wall Street comodities traders behind the rise in gas prices. It’s the Jews. It’s all the Jews. Yay us! Are Jews also Bilderberg Free Mason Illuminati?